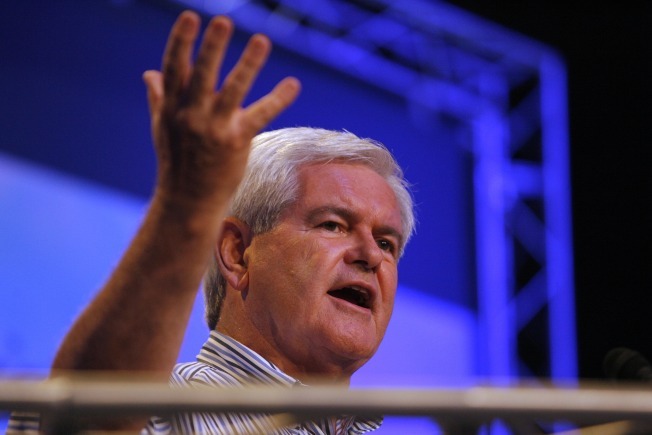 Gingrich Camp: Plagiarism Claim "Silly"
Former Speaker of the House Newt Gingrich called Palin plagiarism claims "just silly." On Saturday, Huffington Post blogger Geoffrey Dunn accused Palin of lifting passages from a column Gingrich co-authored with Craig Shirley in November 2005. Palin twice referenced Gingrich in her remarks, but Dunn claimed she did not give enough credit. Dunn’s biography on the site says he is writing a book about Palin that is due to be published by Macmillan/St. Martin’s Press in 2010. An Associated Press story on Palin’s denial that she plagiarized Gingrich, a response to the blog post, was the lead story Monday on the Huffington Post’s heavily-trafficked politics page. The plagiarism charge has received broad play in the progressive blogosphere and in stories in Politics Daily and the Anchorage Daily News. The Huffington Post item held up several examples from Palin’s speech in Anchorage last week introducing Michael Reagan, son of the former President Ronald Reagan, and the 2005 Gingrich and Shirley column. “First, I think what we're going to learn tonight via Michael is that Ronald Reagan's ideas were the right ideas and all we have to do is look back at his record, his economic record and his national security record to know that his ideas were right,” Palin is quoted as saying.